When people talk about dementia, it seems like the focus tends to be on what is lost. This is for good reason, certainly; loss of memory leads to a lot of confusion, uncertainty, and sometimes sorrow, as we’ve seen at Silver Club and Elderberry. That said, working with members in Silver Club over the past semester has really made me more interested in what pieces remain in a person living with Alzheimer’s. Another woman that I worked with a number of times made evident several weeks ago that she just wasn’t really feeling up to making art. I got to a point where I stopped introducing projects to her, and just spent the time focusing on singing together; she has a database of memorized lyrics like I’ve never seen! Even though I gave up on the visual aspect a little while ago, a staff member lent us her ipad on one of the last Silver Club days and invited us to play with an app that lets you doodle on the screen. To my surprise, my partner took to it very well, despite frustration with the technology, and had a very deliberate and intentional way of creating line. It was exciting to see her readdress the interest in art that I knew she had- if only for a brief time! It’s amazing to me that both of these women can tap into a deep-seated interest and talent in art that, at this point, they may not even know they had. The last palindromic day of the year (3/19/13) was the first day of my collaborative project with my Elderberry partner. Throughout the semester, she often brought up the established hobbies in her life: gardening, cooking, vegetarianism, painting, but above all, singing. After learning this, one day I tried singing some Beatles tunes with her, and was pleasantly surprised to find that she remembered the lyrics to Blackbird. She remarked, “I’m so glad to know young people are still singing things like that,” which made me laugh, and I assured her that we young people knew all about the Beatles. Therefore, when the time came for us to plan our collaborative projects, I decided I would learn some Beatles songs and, manned with my guitar, sing with my partner. I was really nervous, anticipating that she wouldn’t enjoy the activity, or wouldn’t remember any of the lyrics and I would end up serenading her, which I would have enjoyed, but I wasn’t sure that she would. However, everything ended up being fine. I strummed, and we sang, and during the choruses of certain songs, I was delighted by how her voice rang out, and I could tell she radiated happiness. That day was a little different from previous sessions where we worked together on paintings, collages, and the like. Though she enjoyed spending time together and creating art, I could tell on that first day of our collaborative project, my partner was genuinely happy. I could tell that singing is what she uninhibitedly enjoys. This experience made me realize that it didn’t matter if my partner remembered the lyrics or not. She simply enjoyed the act of singing, sharing in a musical experience and letting her voice ring out. I had been so hung up on making sure to print the lyrics in a big enough font and organizing the papers while we were singing. However, halfway through the hour, I realized I needed to just let it go and put the papers down and look at my partner and sing. That’s when we enjoyed it the most, and it reminded me of the importance of relaxing and flexibility in every aspect of life, not just working with a person with Alzheimer’s disease. Reading Alzheimer’s literature it’s hard not to get bogged down in sadness. The illness is one that is takes without remorse, stealing someone’s ability to communicate and remember their loved ones. Yet every time I go to Silver Club and Elderberry, rather than become depressed, I am inspired by the men and women who have this disease. They are people with such colorful personalities, wonderful stories, and positive attitudes. I was amazed by her insight and fearless attitude; she challenged me and made me realize that my hesitancy was an expression of fear. She, who has every reason to put up walls if she wanted to, was telling me to let go of my fear and try new things. It was an inspiring moment, and one that made me examine how I live my life. Every time we visit, the member I work with thanks me for coming, but this moment showed me how much I have to gain from this experience. Sharing art and life experiences through this class has affirmed to me that while Alzheimer’s is a condition that takes, the people who have it still have a lot to give. My two members never cease to surprise me with their creativity and positive attitudes. The great thing is that that is where the similarities between them end, because they are very different individuals with very distinct styles. I noticed this right upon meeting them. The first member always takes a moment to pause and think about where to make her mark on the page. After a few pensive and still moments, you can always count on her to say that the image “needs something.” Her work tends to be minimalist, orderly and thoughtful, and she rarely needs suggestions. Her pace tends to be very slow and steady since she balances her creative time with careful planning and thinking. On the other hand, the other member attacks each new project with unbridled zeal and joy. He often does two or even three pieces in the short amount of time that we are allotted. He has a little more trouble with fine motor skills, but paired with his outstanding energy and attitude, this often results in very free marks in his work. I’ve noticed that he responds really well to and is open to minimal suggestions, such as how to manipulate media in a different way. After observing this for a few weeks, I decided to tailor a particular project to the way each of them likes to work. It was a simple Mondrian-inspired piece that involved taping the paper off into rectangular sections and painting with primary colors. For the female member, I made sure to make more boxes for her to fill in because I knew she would enjoy organizing the colors, while I gave the other member larger spaces because he enjoys the act of painting more than planning. I also gave each of them different tools. The precision-driven member was given fast-drying paper and a small brush ideal for the exact marks that are a hallmark of her style. 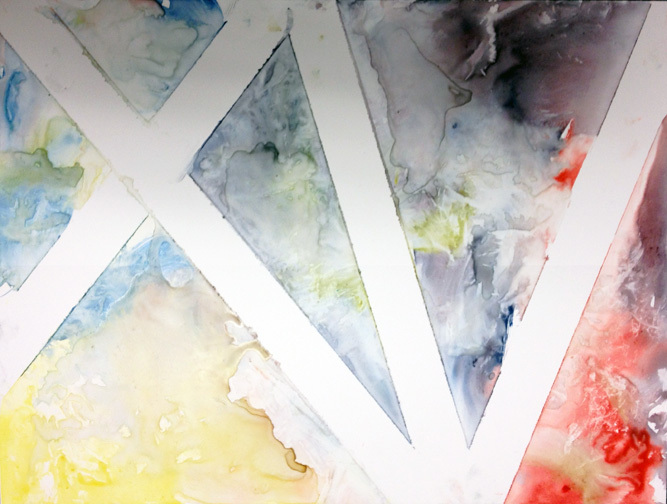 Conversely, the stylistically energetic member was given slow-drying Yupo paper so he could make printed patterns with paper towels and other materials after painting. Both members really seemed to enjoy themselves, and the work they made that day really showcased their respective styles.